(Click photos to enlarge them) Sent to us by a reader, this is a classic photo of the Special Agents In Charge in February, 1935 (or "acting SAC) taken during firearms training. It is a bit puzzling why Melvin Purvis (No. 41) is hidden from view in row two. Reason for this is anyone's guess at this point. Purvis would resign from the Bureau in July, 1935. The "red x" is due to the sender's research being done on SAC R. A. Alt. This particular photo appears to have come from some personal belongings of Alt's that made their way to an auction. William Ramsey (9) would later be killed in the line of duty. 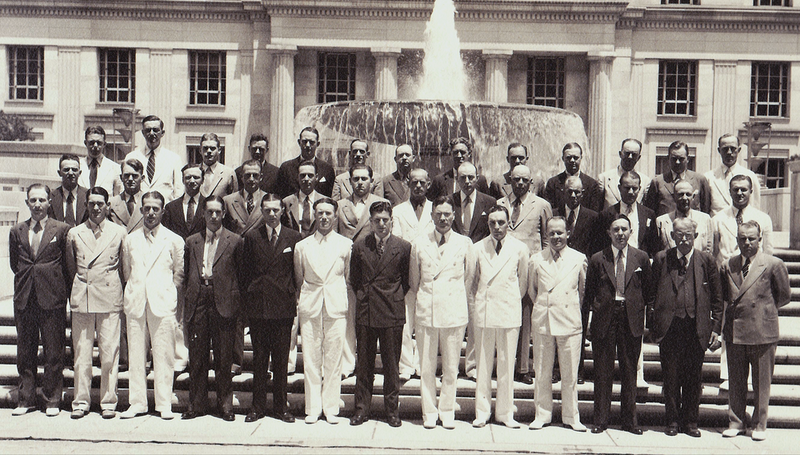 FBI Special Agents In Charge (SACs) - 1936 At FBI Headquarters, Washington, D. C.
Left to right, front row: H. D. Harris, T. N. Stapleton, R. B. Nathan, D. M. Ladd, V. W. Peterson, E. P. Guinane, W. S. Deveraux, E. J. Connelley, J. C. Newman, O. C. Dewey, R. L. Shrivers, D. H. Dickason, and C. C. Spears. Left to right, second row: L. I. Bowman, W. L. Listerman, R. D. Brown, R. E. Vetterlie, G. N. Lowdon, B. E. Sackett, Werner Hanni, C. W. Stein, R. H. Colvin, F. J. Blake, W. A. Rorer, R. A. Alt, and H. H. Reinecke. Left to right, third row: E. K. Thompson, C. Fletcher, W. A. Smith, D. W. Magee, E. L. Richmond, J. P. MacFarland, J. A. Dowd, E. E. Conroy, R. Whitley, H. E. Andersen, D. Brantley, J. H. Hanson and E. Scheidt. This photo was provided to us by the granddaughter of SAC E. J. Connelley during 2013. The names above have been taken from the back of the photo. It was taken in 1936 at the height of the gangster era. By 1936, most of these men had less than ten years in the Bureau and some less than five years. On the other hand, a few were already nearing their twenty year anniversary! This somewhat rare photo provides a unique opportunity to place faces with names, many of whom are part of the early legends of the FBI. Just off the top, Connelley's legendary exploits in the FBI are mentioned elsewhere on this site. Virgil Peterson was previously the Supervisor of the Dillinger Squad in Chicago under SAC Melvin Purvis (Purvis left the Bureau in 1935.) Richmond, Reinecke and Brown, above, were members of that team in Chicago. SAC Jay Newman, shown above, was wounded by "Baby Face" Nelson at the shootout at Little Bohemia Lodge, just two years prior to this photo. SAC Ralph Colvin was SAC at Kansas City when the Kansas City Massacre occurred in June, 1933 and his letter to Hoover later that month about needing more and better weapons sparked the FBI's immediate additional arming of its agents. His letter is seen elsewhere on this site. He was followed as SAC Kansas City by Conroy and Nathan during that investigation. SAC Rorer was of course involved in the apprehension of "Machine Gun" Kelly and Werner Hanni was SAC and present during the Little Bohemia shootout also. We do have some biography information on these men and perhaps other information so ensure you do a "site search" on the names.